In 1918, at the 11th hour of the 11th day of the 11th month, the conflict pitifully dubbed the “war to end all wars” finally came to an end. Deep in the forest of Compiègne, about 40 miles north of Paris and aboard a carriage of a private train belonging to the French Supreme allied commander, Marshall Ferdinand Foch, representatives of France, Great Britain and Germany met to sign the armistice which put an end to the unparalleled slaughter. And what slaughter it was. Although it is not possible to be completely accurate when accounting for the casualties of World War One, its estimated that the fighting claimed almost 7 million civilian lives and 10 million military personnel. Russia alone suffered a staggering 1.7 million deaths and 4.9 million wounded. In four years Britain endured 658,700 fatalities, 2,032,150 wounded and 359,150 men missing in action. This adds up to total of 3,050,000 casualties. These figures are astonishing and difficult, for me at least, to comprehend. Millions and millions of lives lost. We don’t really understand what a million is, do we? There haven’t even been a million days since the birth of Christ. 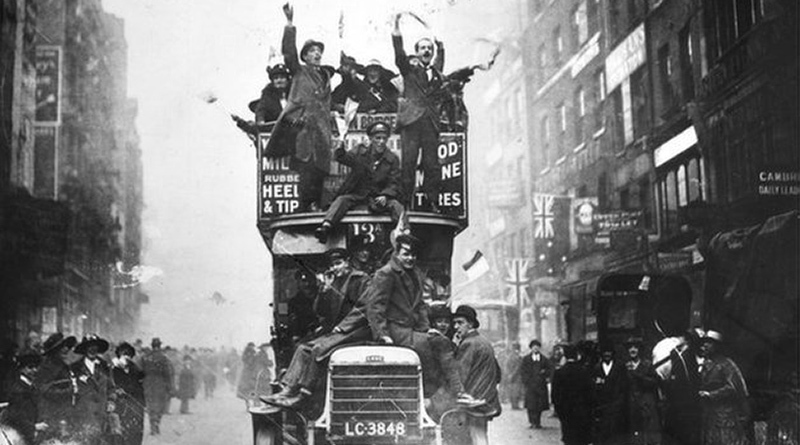 World War One devastated Britain and changed it forever. Yet, for much of the conflict, the horror of its progress was kept from the public. During the war, publishing information that was calculated to be indirectly or directly of use to the enemy became an offence and was punishable in a court of law. This included any description of war and any news that was likely to cause any conflict between the public and military authorities. Reporters – and there were only five accredited war correspondents – operated under the intense scrutiny of the high command. Although they were treated well – given uniforms, rank and housed in the same French chateaux as their military superiors – they were forbidden from (without express permission) writing about where they were, from referring to regiments, and from writing about soldiers other than commanders-in-chief. Indeed, in an effort to ensure that nothing at all be published that may endanger the war effort, their every move was accounted for. They were accompanied at all times by army censors who had the authority to use chemicals to search for the use of invisible ink in dispatches. The point is: they were there to provide stories of derring do, aid recruitment and keep the high command from criticism. Even if reporters had wished to “tell the truth” and their copy had made it past the censors, then the editors and proprietors back home would have ensured that their writing did not see the light of day. Lord Northcliffe, owner of the Times and Daily Mail ended the war as director of propaganda in enemy countries, while Lord Beaverbrook, later the owner of Express newspapers, was minister of information. Robert Donald, editor of the Daily Chronicle, was director of propaganda in neutral countries. This was hardly an environment where truth and objectivity were likely to flourish. And of what of Wales? How did the Western Mail greet the armistice? Well, if you were go purely by the front page on November 12th then you would be hard pushed to find any reference at all. The biggest item, in a broadsheet of closely typed text dealing with marriages, deaths, the sale of dairy cows and countless other advertisements, is notice of the clearance sale of Fur coats from James Howell! Let’s not be too surprised at this, though – to have a front page dominated by ads was common to most newspapers. Then, as now, their revenue was vital. Then we are onto the celebrations across Wales as headlines proclaim “THE GREATEST OF ALL WARS HAS ENDED” and “WILD JOY – DAY SCENES with “STIRRING INCIDENTS ACROSS SOUTH WALES”. We learn in detail of the experiences of the Welsh Guards and the “nearly 40” Welshmen who received the Victoria Cross, the highest military honour. As we honour the dead of all conflicts this coming Sunday it is especially vital that we continue to remember World War One. Its veterans are all gone now, but we have the testimonies and the stories, the poetry and the pictures. The majority of us, in our relatively comfortable lives, are preoccupied by the inconsequential and the truly unimportant. It is only through the knowledge of our history that we can appreciate that good fortune. By the hundred thousand, young men have died for the hope of a better world. They have opened for us the way. If, as a people, we can be wise and tolerant and just in peace as we have been resolute in war, we shall build them the memorial that they have earned in the form of a world set free from military force, national tyrannies and class oppressions, for the pursuit of a wider justice in the spirit of a deeper and more human religion. Little was the writer to know, of course, that in little more than 20 years the world’s young men and women would again be fighting to free the world from “military force, national tyrannies and class oppressions”. Plus ca change.